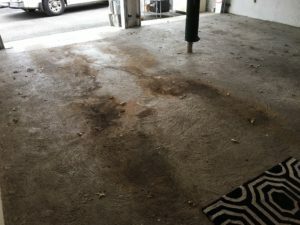 In many cases your floor cannot be epoxied all in one shot due to too much stuff to move out or the floor had some repair areas done for lets say for new plumbing. In the case of where you have an existing floor where you cut out some concrete to repair or to install new plumbing. You now have to wait 28 days for the new concrete over the new plumbing to cure but you need the rest of the floor before then. Here’s how you do the floor in sections so you don’t end up with a seam. Tape off where you need to end the first section then apply the first layer of coating whether it’s a primer or an epoxy. Then apply the next layer and keep back about 12″ from edge of first layer. If you’re using our Ultra Military System you’ll have a third coat to do. So you would apply that and stay back 12″ from second layer. Now you have a stepped layer effect. Next lightly sand with 100 grit a 12″ strip of each layer that will be overlapped when you do the next section. The reason for this is that after 24 hours our epoxies start to seal up and then it becomes like trying to paint over glass. So always rough up an epoxy that you’re overlapping after 24 hours. This insures a proper bond from the first section with the subsequent sections. 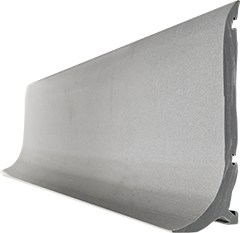 Now in the case with the new concrete areas we would recommend you start your tape line 12″ back from the new concrete. Everything else is the same as above. 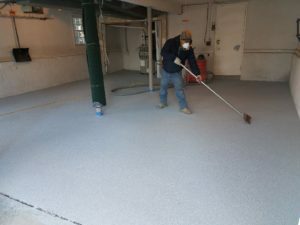 Just be sure to acid etch the new concrete after 28 days before applying any of our epoxy flooring systems. And of course if you have any questions please feel free to contact us at info@armorgarage.com or 866-532-3979. 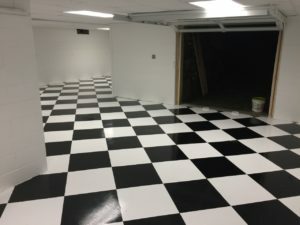 What To Do If You Miss A Spot On Your Garage Floor Coating? So you’re apply your garage floor coating or commercial epoxy flooring and all is going well until you get a few sections along in the application and you look back and suddenly you see to your horror that you have missed a spot!. First thing is not to panic and what every you do do not walk back on the wet epoxy to fix it. Here’s what you can and should do. This is where those spoke soles come in handy! If you have them and it hasn’t been to long since you noticed the missed spot that walk over to the spot with the spikes and fix. This goes for a missed spot of the color flakes. You can simple add more flakes to a bald spot. If you haven’t noticed it till after you’re completely done and you don’t have spikes. Just wait for the floor to dry and go over and patch it. In the case of wanting to add more flakes you need to apply a very thin layer of epoxy for the flakes to stick onto. A very common occurrence is missing a spot with the clear topcoat. Since these topcoats are Gin clear it’s easy to do while you’re applying them. This is no issue at all. After the topcoat dries just very lightly sand the epoxy and perimeter clear coat with 100 grit. Then brush on some clear to fill in. 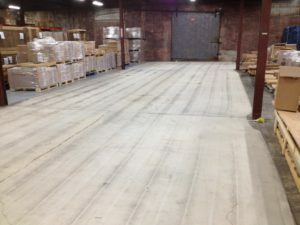 To help avoid missing spots dry to have someone looking at the floor from an angle while you are rolling on the clear. So in sum, don’t panic, having spikes is a good idea for emergency puposes and for applying the flake into the epoxy, they make getting an even pattern much easier, don’t let the main part of the floor dry for over 24 hrs before apply next layer and if you have a more serious issue just contact us and one of our expert support guys or gals will get you back on the right track.